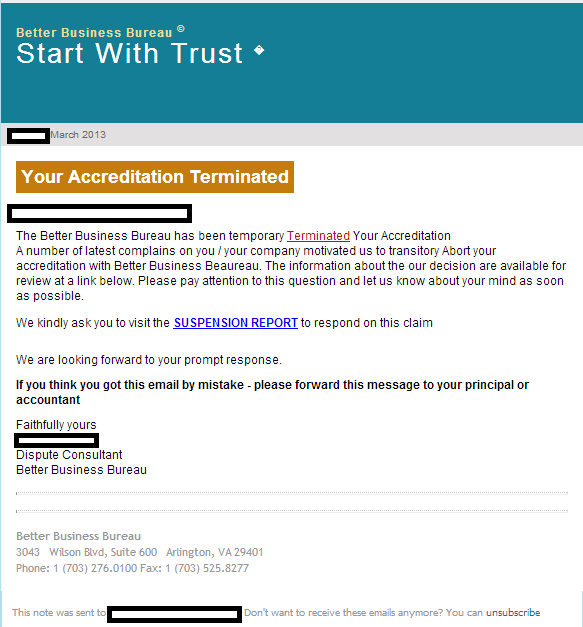 Over the past week, a cybercriminal/gang of cybercriminals whose activities we’ve been actively profiling over a significant period of time, launched two separate massive spam campaigns, this time impersonating the Better Business Bureau (BBB), in an attempt to trick users into thinking that their BBB accreditation has been terminated. Once users click on any of the links found in the malicious emails, they’re automatically exposed to the client-side exploits served by the Black Hole Exploit Kit. Not surprisingly, we’ve already seen the onetoo@gmx.com email in the following previously profiled malicious campaign – “Malicious ‘Data Processing Service’ ACH File ID themed emails serve client-side exploits and malware“. We’ve already seen 213.214.74.5 in the following previously profiled malicious campaign -‘Your Kindle e-book Amazon receipt’ themed emails lead to Black Hole Exploit Kit“. As well as 203.114.112.156, seen in the following assessment “Fake ‘You’ve blocked/disabled your Facebook account’ themed emails serve client-side exploits and malware“. As for the pseudo-random characters used in the C&C communication (UCyqrDAA/Ud+asDAA/), we’ve also seen them in the following previously profiled campaigns, indicating that these campaigns have been launched by the same cybercriminal/gang of cybercriminals.